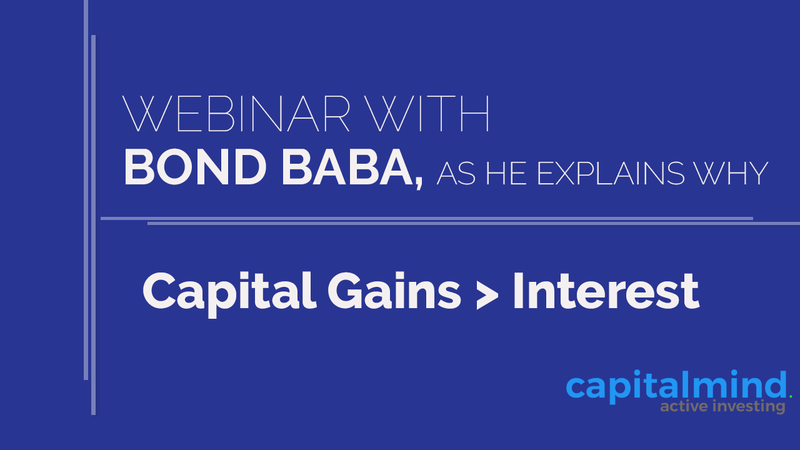 Capital Gains Better Than Interest Income - Bond Baba Teaches - How? We had an interesting webinar on August 05, 2016 Friday. We discussed what our Bond Baba had been teaching us and we put it out to the world to learn. The topic of the webinar was “How it’s more useful to have bond income as capital gains rather than as Interest income“. We covered the following topics in detail and answered a few questions at the end. How to buy bonds on an exchange? How to choose ‘that’ right bond which gives considerable amount of money in return? We took more than an hour to explain every aspect in detail with live real world examples. We took Edelweiss NCDs as an example and explained cash flows for every successive year in a 10 year tenure. You can find the Edelweiss NCD doc here. Debt funds delivered 9-10% CAGR with indexation benefit over 3 years. So, aren’t debt funds better than directly investing in bonds? Can the listed infrastructure bonds be bought on exchange and used to claim tax benefit? How do you decide the right time to exit a bond? What is the meaning of Dirty Price? Does one need to monitor the credit quality of the NCDs during 3 years? If so, how? Can you review Sovereign Gold Bonds? Go ahead – watch the video at leisure and post your questions in the comments section below. We do webinars like these on a regular basis. Our Premium members get an invite to join live on the webinar to shoot their questions at us. Click on this link here to get to know what our premium members avail as part of their subscription.